Simply put, there is no excuse for getting behind the wheel of a car or truck while drunk. Not only do drunk drivers put their lives at risk, but also the lives of their passengers and anyone unlucky enough to share the road with them. The thing is, drunk driving crashes are completely preventable. All it takes is someone making the decision to not drive drunk. That’s it. Yet according to the National Highway Traffic Safety Administration (NHTSA), every two minutes, someone suffers an injury in a drunk driving accident. This is pretty clear evidence that there are a lot of people out there making the wrong decision when it comes to drinking and driving. Breathalyzer and blood testing measure a driver’s blood alcohol content (BAC). If a driver’s BAC is .08 percent or higher, it is illegal for him or her to be driving in every state. What Should I Do If I’m in a Car Accident Involving a Drunk Driver? If you are in a car accident and suspect that another driver involved in the wreck was drunk, you should first make sure that everyone involved in the crash receives immediate medical attention. After that, you should contact 911 and report the accident. Stay on the line with the 911 operator until the police arrive at the scene. Prior to the police arriving, try to take photographs of the accident scene and your injuries. In addition, get the names and contact information of the other drivers and passengers as well as any witnesses. If safe and possible, move your vehicles from the road if they are blocking traffic. If the other driver was drinking, there is a chance he or she will attempt to flee the accident scene. If the other driver flees, do not chase them. Instead, if possible, get the driver’s vehicle’s license plate number and a description of the driver and his or her vehicle. Does It Help Victims If a Drunk Driver Is Arrested? Drunk drivers should be charged and arrested for driving under the influence of alcohol. However, even if a drunk driver is charged, arrested, and convicted, it does not help the victims of his or her negligence with financial difficulties. As opposed to a criminal conviction, a civil lawsuit can provide victims and their families with the financial help they need to cover hospital bills, loss of income, living expenses, rehabilitation, physical therapy, and funeral costs. Can Car Accident Victims Sue Drunk Drivers? However, a drunk driver’s criminal conviction does not help victims and their families with the financial burdens they face because of a drunk driver’s negligence. Why Should I Sue a Drunk Driver? 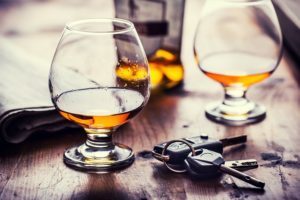 A personal injury lawsuit provides the victims of drunk driving accidents with the opportunity to hold those responsible for their injuries or the loss of their loved ones, including securing financial compensation for their pain and suffering. Related: Dram Shop Law: When is a Bartender Responsible For a Drunk Driving Accident? How Do Injury Lawsuits Against Drunk Drivers Work? If you have been injured or someone you love has been killed because of a drunk driver’s negligence, you have options to fight back. Whether a drunk driver is facing criminal charges or not, victims can file a civil lawsuit against the drunk driver. Unlike a criminal conviction, which can only result in criminal punishment, a personal injury lawsuit can result in monetary compensation for victims and their families. In addition, civil lawsuits require less proof than criminal lawsuits. Crimes must be proven beyond a reasonable doubt. Civil lawsuits on the other hand must only be proven to have more likely than not occurred in the way that a victim claims it did. As such, civil claims are generally easier to prove than criminal claims. Drivers, passengers, and pedestrians that have been injured because of a drunk driver’s negligence and the families of victims killed in drunk driving accidents should speak with a personal injury lawyer as soon as possible after the incident. Many qualified and experienced personal injury attorneys will discuss your situation with you free of charge. During that meeting, you can have your questions answered, learn whether you have a valid case, and hear about the best options available for you and your and family moving forward. In addition, the sooner a car accident attorney can begin working on your case the better your chances of securing the compensation you need for hospital bills, loss of income, physical therapy, an in-home caregiver, a stay in a long-term nursing facility, and funeral costs. The reason for this is because before your accident scene has been cleared, the other driver’s insurance company will have investigators and in-house attorneys gathering evidence and building a case against you for causing the accident. Therefore, you need someone on your side from day one fighting to ensure that the other driver and his or her insurance provider pays for the negligence that led to your injuries or the loss of your loved one.